With the Esplanade, harbour foreshore, restaurants, shops, Night Markets, Reef Casino and Marlin Marina a short stroll away; you are close to everything that makes Cairns a great destination. 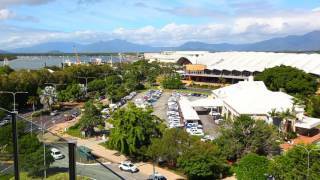 For guests attending trade shows, conferences and other events, Cairns Convention Centre is conveniently located directly across the street from the hotel. Whether your stay is for business or pleasure, Park Regis City Quays is your ideal 'home away from home' whilst in Cairns. Relax and unwind in your modern hotel room or one/two bedroom self-contained apartment - all with individually controlled air-conditioning as well as ceiling fans, complimentary Wi-Fi Access (Up to 1GB daily download limit), cable television and most with large balconies. To enhance their guests' experience, their superior rooms have recently been given a fresh new look including new pillow top beds and bedding, modern desks/work areas and new technologies such as iPod docking stations and high definition LCD televisions. Relax and unwind in your Executive Hotel Room with individually controlled air-conditioning as well as ceiling fans, in-room safe and complimentary Wi-Fi Access (Up to 1GB daily download limit). The recently refurbished Executive rooms have been given a fresh new look including new pillow top beds and bedding, modern desks/work areas and new technologies such as iPod docking stations and high definition LCD televisions with cable television. Rates are for two guests. Bedding is one Queen bed. Relax and unwind in Executive One Bedroom Apartment Room with individually controlled air-conditioning as well as equipped kitchen, ceiling fans, complimentary Wi-Fi Access (Up to 1GB daily limit), cable television, in-room safe and with large balconies. The rooms have recently been given a fresh new look including new pillow top beds and bedding, modern desks/work areas and iPod docking stations and high definition LCD televisions. Rate is for two guests. Bedding is one King Split bed. Enjoy the comforts of home in one of their Executive Dual Key Two Bedroom Apartments, with individually controlled air-conditioning as well as ceiling fans, complimentary WiFi (up to1GB daily), cable television, in-room safe and with large balconies. The rooms have recently been given a fresh new look including new pillow top beds and bedding, modern desks/work areas and new technologies such as iPod docking stations and high definition LCD televisions. Rates are for four guests. The apartment is configured with one king split bed and one queen bed.